As an wedding alterations specialist, once in a while I will get a pregnant bride-to-be who needs a wedding gown altered. Sometimes they have already purchased a wedding gown and will be only a few months pregnant when they get married. Others call before purchasing their gown and will be 6 or more months along when they get married. They need to know how many sizes up they should purchase their gown and what can be done to let the dress out further, if needed. So when should you contact a sewing professional? Should you purchase another gown? What can be done to fix the gown you already have? An empire waist gown, is the best style choice to buy for a pregnant bride. There are styles that have gathers or tucks at the seam for the skirt section of the gown that will give you extra room over your stomach. Just make sure the lining has enough room also. A few other styles can be worn as a maternity wedding dress, such as a princess line and and some full a-line wedding gown styles. But you need to order the gown 2-3 sizes bigger than your regular size. If you are going to be 7 or more months along at the time of your wedding, you definitely need 3 sizes up. It may be a bit big in the bust, which can be taken in. It is easier to take something in than to let it out. If you are a bride who has purchased a gown, and now you find that you will be 4 months or less along when you get married... you may be able to get away with letting the gown out on the sides. But what if there isn't anything to let out? "This bride was pregnant. The amount of separation you see spread apart for each side of the dress, is how much of her back was exposed. She had a zipper closure. To fix this... I took the zipper out and converted this to a lace up back closure with a modesty panel. The bride was delighted with the results." If you are a pregnant bride who is going to be 5- 7 months along in your pregnancy on your wedding day, you will probably need gussets to be sewn in your gown. A gusset is a wedge or pie-shaped piece of fabric that is inserted in the seams. The narrow end of the wedge shape is down by the hip and widens out at the top edge. A gusset can also be a panel that runs the whole length of the gown. The design of the dress, and whether you can match the fabric determines if the gusset will blend in or not. To get extra fabric to match, usually the scraps from the hem is used. Another source for fabric, is to use the fabric from the wrap that came with dress. Otherwise, you have to make a trip to the fabric store to see if you can match something up with the dress. Another solution that has been working for some wedding gowns is to convert the zipper into a lace up corset back. This will not only fix the problem but add style to the back of the gown. No one will know that it wasn't suppose to be that way. Being a pregnant bride means you need to find a wedding alterations specialist as soon as you know you are pregnant. Each sewing professional work with their clients differently. I typically see a pregnant bride 2 months prior to the wedding to get an idea of how the current wedding dress fits. Then I decide what needs to be done and schedule fittings closer to the wedding. I actually start the work about 3 to 4 weeks before the wedding. The goal is to have a bride pick up 1 week prior to the wedding. I schedule my clients for at least one or two fitting. It all depends on how far along they will be at the time of their wedding. The further along they are, such as 6 to 9 months, the more important it is to finalize your alterations about the 1 week prior to the wedding. You will experience growth spurts between your seventh and ninth month period. So make sure you have a seamstress that is willing to work with you! 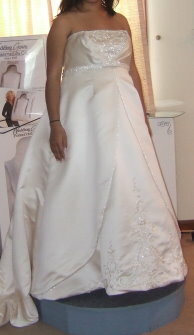 "Here is a pregnant bride at a final fitting, who was one of my clients. Her dress had to just about be totally taken apart to shorten it and to take in the bodice. She bought it several sizes bigger than her regular size. You can read her review submitted to this site." The pregnant brides guide to picking the right maternity wedding gown that is her perfect dress. 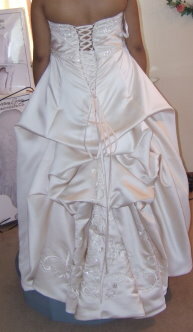 This page describes what can be done to resize your bridal gown if it is too big or too small. It shows what gussets look like. 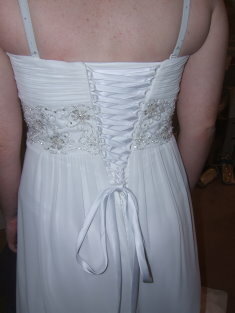 Transforming a zipper back gown into a lace up corset wedding gown. Click on the link below for Desiree's Custom Sewing.